Stumptown was started with the goal of doing things differently, with a vision that’s always been a little left-of-center, and with the focus squarely on quality. They source the best coffees in the world and strive to maintain transparent, quality-based relationships with the farmers along the way. From plant to portafilter, they pay homage to these origins through their fervent attention to detail at every step, quality control in their cupping labs, meticulous roasting profiles and extensive education. Visit Stumptown Coffee to dive into the delicious world of Stumptown. 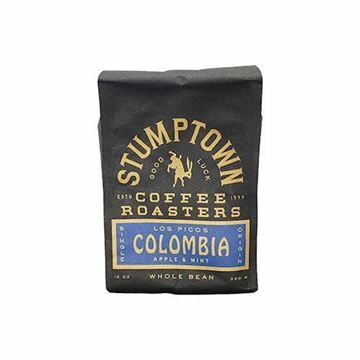 Stumptown Colombia Los Picos Whole Bean Coffee - 12 oz. Whole bean coffee with notes of baking spices and apple pie.